The news is reporting that David Carradine died today:  NY Times; BBC News. As a tribute, I wanted to post a story about the unlikely connection between my favorite childhood television show, Kung Fu, and the food I eat today. I’ve been trying to figure out why and how I became interested in vegetarianism in the first place, how and when I first learned the meaning of the word. Why did I get interested in this way of eating in the first place? I did not have friends or relatives who were vegetarians. I loved fried chicken, and did not equate animals with the meat I ate until much later in life. What first piqued my interest in vegetarianism? I have a few developing theories. 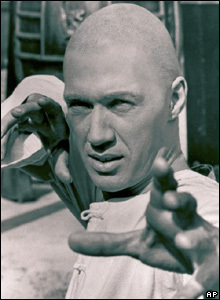 One of which is this:  Kung Fu, the 1970’s television show starring David Carradine. After rigorous training at the Shaolin Temple in China, Cain becomes a priest, a master of kung fu, fabled to walk through walls, invincible. Nevertheless, after killing a nephew of the Chinese emperor in defense of a Shaolin master, Cain must leave the temple, leave China, and wander forever, always staying one  town ahead of the emperor’s police and a wide array of bounty hunters motivated by posters depicting Cain’s face and offering rewards of $10,000 for him alive, $5,000 for him dead. Cain’s steady, relentlessly methodic pace carries him across deserts, apparently across oceans, to American, and into towns of the Western frontier. I loved Kung Fu when I was a child. I watched it so intently, with such deep concentration, I would forget to move. After lying on the floor on my belly, chin propped up on my hands, or sitting cross-legged, focused completely on the Sony Trinitron, I would move at the end of the show and discover pin-pricking legs, arms, feet. In fact, I remember the feeling of watching the show so much better than the actual story, that my husband borrowed the first season on DVD from the library for me to watch and reminisce. The pilot episode began slowly, slower than I remember TV ever being. I braced myself for disappointment, worried the show conveyed ideas invisible to me as a child, offensive to me as an adult:  sexism, Racism, or maybe just plain hokiness. Happily, I can report that the show holds up after almost forty years. The slow, deliberate pace of the action matches the perpetually meditative nature of Cain and lulls me into a peaceful, observant state, meditative and calm, the direct opposite of what TV does to me today. After watching the pilot show, I turned to the first episode, “King of the Mountain.”  To my surprise this episode may be the source of my first understanding of vegetarianism. Although I did not hear the word “vegetarian” spoken in the episode, Cain explains the concept in his laconic way to a little boy close to my age at the time. If not my first introduction of vegetarian life, surely this was the first exposure to strike me so personally and valiantly, wrapped within the quiet, soulful, powerful Cain I so admired for his inner power. King of the Mountain:  Cain meets Peter, a young boy, just after Peter’s father has been killed and his mother abducted. Cain offers to walk Peter from his burned log cabin to the town where his aunt lives. They set off with only a small pouch of belongings and supplies. During the journey, Cain stops his rhythmic walk (pace and effort unchanging, whether he traverses a river, steep rock, or dusty soil) to watch a rabbit hop its way across the set. Peter, a resourceful frontier boy, takes aim with his rifle, shoots, and cheers his success at killing the rabbit for their dinner. Cain simply lowers his eyes, saying nothing. Much later in the story, after the boy’s aunt turns out to be married to a horrible man with even more horrible sons and Cain finally gives in to fighting them because there is no other way to enlighten the greedy, grubby (really, they have dirt smeared on them in all scenes) thugs, Cain and Peter end up living on a ranch run by a single woman. Cain earns their keep by fixing her fences, taming her wild stallion with a few crane-inspired kung fu moves, and other chores completed just as methodically as his walk across the country. One day, the three go for a picnic, and Cain and Peter lie together on the bank of a creek watching an otter while the perky, blonde, blue-eyed rancher sits at a distance on a checkered blanket, her dress smoothed over her knees, surrounded by food. Cain explains harmony with the universe to Peter, concluding with a pointed gaze at the boy, “So we must seek a discipline of mind and body within ourselves.”  Just then, the ranch woman calls out enthusiastically, “Anyone still hungry? Lots left to eat!”  The camera pans to her, waist deep in baskets of food, like some Greek goddess of indulgence miscast in this story of stern eastern philosophy. Peter replies decisively, “I don’t eat meat,” and the ranch lady mouths a long, resigned, “ohhhhh,” as the camera leaves her alone with her bounty of baskets apparently filled with meat. Okay, so the show holds up after all these years, maybe it is a bit hokey, but I still love the show and find myself as absorbed as when I was a child. The episode also gave me a glimpse into my past and why I eat the way I do. Cain (and then Peter) not eating meat was not depicted as some great sacrifice and loss of pleasure or health or strength. From Cain’s past, the master echoes that no life is insignificant, and during the voice-over, the scene shows the young monks learning dynamic fighting postures from the tiger, crane, and other animals, depicting vegetarianism as masculine, powerful, a higher level of wisdom and ability. It suggests the priests learn from animals, derive some of their power and wisdom by mimicking them. As a child, just as now, I’m sure I felt drawn to the challenge to “seek discipline of mind and body” within myself. The line immediately following Cain’s insight about disciplining the mind and boy, is Peter declaring, “I don’t eat meat.”  This juxtapositioning linked vegetarianism to the powerful discipline, strength, insight, wisdom.